Lily Thomas is an aspiring ski champion training for the Olympics, a young woman with her heart set on winning the gold. But in one moment, Lily’s future is changed forever, her hopes for the Olympics swept away in a tragic accident. Dr. Jessie Matthews, the neurosurgeon who operates on her that night, endures a tragedy of her own, and instantly becomes the sole support of her four young children, while her own future hangs in the balance. Bill, Lily’s father, has pinned all his hopes on his only daughter, his dreams now shattered. Other lives will entwine themselves with theirs: Joe, a financial manager, faces a ruined career at the hand of a dishonest partner. Carole, a psychologist at Mass General, is a breast cancer survivor, her body and heart scarred by what she’s been through. Teddy, with a spinal cord injury worse than Lily’s, dreams of college and becoming an artist. From the ashes of their lives, six people fight to alter the course of destiny and refuse to be defeated. When Bill builds a remarkable rehab facility for his daughter, countless lives are forever altered, and each becomes a winner. Winners is about refusing to be beaten, no matter how insurmountable the challenge. And when Lily gets on skis again and enters the Paralympics, the battle to brave life again is won. Winners is about more than surviving, it is about courage, victory, and triumph. When all appears to be lost, the battle has just begun. 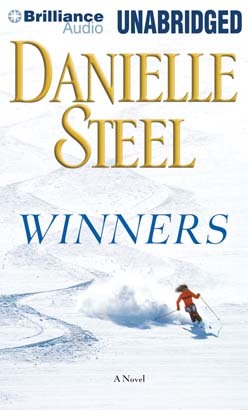 Danielle Steel has another winner. Good book but not a big fan of the narrator's female voices.